With Valentine’s Day right around the corner, love is in the air! Let’s share some of that love with our sprinkler systems and the community around us. Watering restrictions are in place to help ensure that there is enough water for all of our daily activities (drinking, showering, laundry, etc.) and to make sure that it lasts throughout the year. Thankfully at this time of year, most of our vegetation is not growing and does not require nearly as much water as during the warmer months. Fortunately for cities in our service area in Dallas, Collin and Denton counties, the month of February does not generally include extreme temperatures or weather, and surface soil typically does not freeze. According to The Weather Channel website, average daytime temperatures in the month of February range from 58ºF to 64ºF, and nighttime lows range from 38ºF to 45ºF. However, there is still the possibility, albeit small, for freezing temperatures during the month of February. Example – Super Bowl week in 2011. 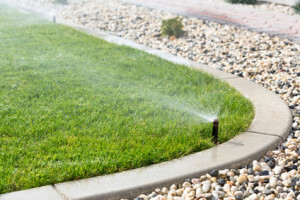 Although many homeowners have turned off their sprinkler systems as most vegetation goes into its dormant stage, there are several things that homeowners can do, or keep in mind, to help to protect their sprinkler system, should the northeast Texas area be exposed to below-freezing temperatures. • Keep an eye on the weather, especially the long-range forecast. This will help homeowners to be prepared for cold weather. • Generally, draining the pipes of a sprinkler system in the winter is not necessary, as the soil provides sufficient insulation to prevent water from freezing. • During freezing temperatures that last longer than a couple of days, insulation may not work well as the cold air has time to penetrate through the insulation, cooling the pipes and equipment and water inside. In areas where freezing weather lasts longer than overnight (rare in our area), but you still need to keep the irrigation system operational, it is a good idea to install electric pipe heaters on backflow prevention devices and aboveground valves. • Equip the sprinkler system with a Rain and Freeze Sensor, a wireless sensor that is mounted to your house and communicates with your sprinkler system’s controller. When the sensor becomes too wet (rain) or too cold (freezing temperatures), it will not allow the sprinkler system to water.